Idle Motion have a knack of discovering great untold stories (cf: That Is All You Need To Know, their exploration of the secret code-breaking world of Bletchley Park) and in Shooting with Light, they focus on Gerda Taro, a pioneering woman whose story deserves to be known just as widely as her colleague and lover Robert Capa’s. With their trademark inventiveness, Idle Motion weave two storylines together, the first being Gerda and Robert’s relationship and interdependency, his career benefiting from her business sense and her talent for photography being unlocked with his encouragement. The second storyline concerns a lost reel of film taken by Gerda during the Spanish Civil War, the conflict in which she lost her life at the age of 26, and the persistence of Robert’s brother in tracking down this mysterious film after Robert’s own untimely death. Packing a tremendous amount into the 80 minute running time, the Idle Motion company incorporate physical movement, dance, music and projections to tell these stories. The sequences portraying battle scenes and Gerda’s death with slow motion movement are especially compelling. Ellen Nabarro’s design is inventive in the theatre’s compact space, being part projection screen and part box of compartmentalised tricks. Hidden windows, doors and telephone booths pop out, setting scenes economically and effectively. Sophie Cullen brings an indomitable spirit to the role of Gerda and Julian Spooner is romantically shabby as Robert. There’s a lovely darkroom scene set to music where they realise their feelings for each other. 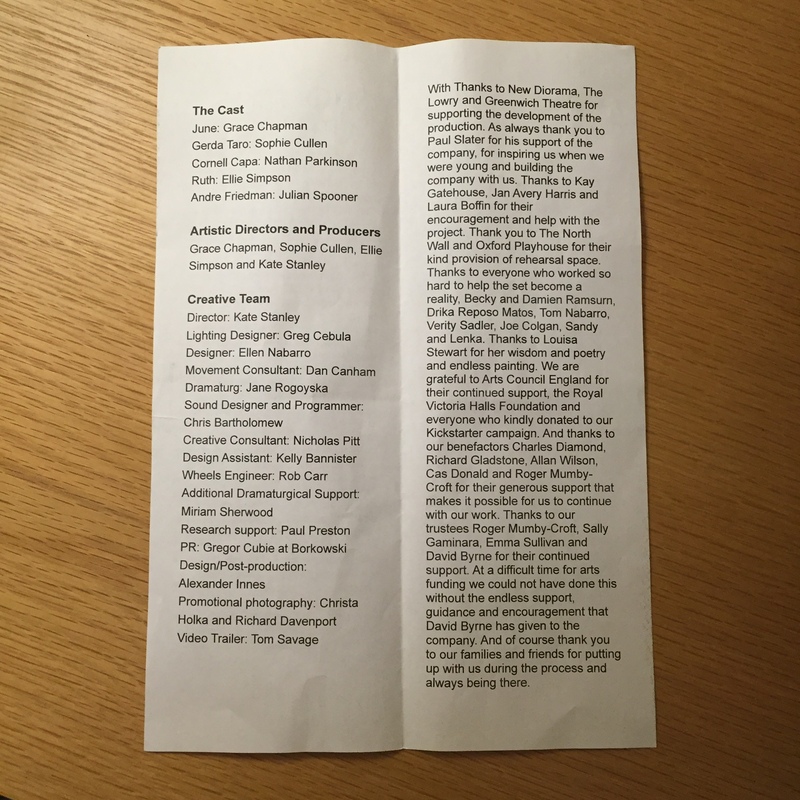 Grace Chapman and Ellie Simpson bring humour and passion to their supporting roles and Nathan Parkinson is sympathetic as Robert’s bereaved brother. Although in many ways a love story, what will stay with me most about Shooting with Light is how a driven, talented woman overcame so much, ultimately sacrificing her life, to bear witness to the horrors of war and to make the world see war’s impact on both soldiers and civilians. And how quickly she was forgotten, especially as much of Gerda’s work has since been misattributed to Robert. Idle Motion, an all-women company consisting of Grace Chapman, Sophie Cullen, Ellie Simpson and Kate Stanley, devise, write and create their own material. Seeing the research, care and passion they put into their work fills me with conviction that they will continue to give voice to the women of the past, rediscovering tales forgotten or ignored by history. 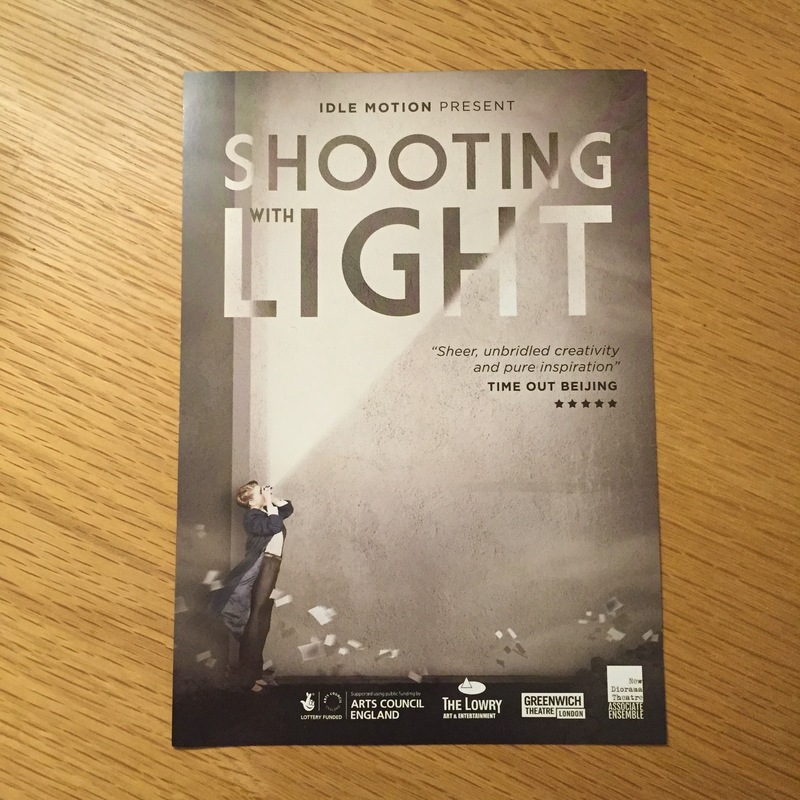 I saw the original production of Shooting with Light back in March 2015 and it returns to the New Diorama Theatre in London this week (Tuesday 20 October – Saturday 24 October 2015). Book your ticket! Idle Motion’s 2016 production will be The State We’re In. Looking forward to it already!